Fig. 61. Operating characteristic curve. a line which shows the relationship between the QUALITY of batches of raw materials or components and the probability of accepting any given batch. Fig 61 shows an operating characteristic curve in which the vertical axis represents the probability of accepting a batch of raw materials or components (or the percentage of batches accepted from multiple batches) while the horizontal axis shows the percentage of defective units in a batch or batches of materials or components. 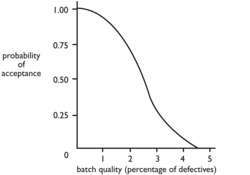 The operating characteristic curve is used as part of an ACCEPTANCE SAMPLING scheme and shows the performance of the sampling plan for any batch quality characteristic. Receiver Operating Characteristic Curve (ROC) of Full Outline of Unresponsiveness (Area under the Curve = 0. Based on receiver operating characteristic curve with area under the curve of 0. Receiver operating characteristic curves of each LFT were used to predict MetS. In the same prediction model, the investigators calculated an area under the receiver operating characteristic curve of 0. Mayer(1967) suggested that the quality standard 'p' can be considered as a quality level, along with certain other conditions to specify an operating characteristic curve later studied by Soundararajan (1975) as the quality level corresponding to the inflection point of the OC curve. Area under the curve (AUC) values were then calculated for each receiver operating characteristic curve to determine the overall predicative strength of the associations. Analysis of data from 369 women with two prior cesarean deliveries undergoing trial of labor after cesarean (TOLAC) delivery showed the area under the receiver operating characteristic curve was 0. To assess the utility of Neutrophil Gelatinase-associated Lipocalin measurements at varying cut-off values to predict indications for dialysis, a conventional receiver operating characteristic curve was generated and the area under the curve was calculated. 760 died, and the area under the receiver operating characteristic curve for [LHL. The best models were selected based on Chi-square values and area under the receiver operating characteristic curve (AUC), Dr.